Partnerships and a reluctance to hang onto loss-making but "strategic" routes are shifting the competitive landscape at London Heathrow Airport. Already-large airlines will grow in size and capability, an effect that increases in significance as slots are already maximised. For Asia's airlines this presents challenges - and some opportunities. Greater competitive pressure and unwillingness to sustain loss-making services saw South African Airways in 2012 withdraw a Heathrow service and hand its slot over to Singapore Airlines, allowing SIA to start a fourth daily service. Qantas also previously cut two services, with British Airways receiving its slots. Meanwhile a new approach to partnerships and alliances spilled over to Air New Zealand and Cathay Pacific. Air New Zealand will drop its Hong Kong-London service while Cathay will use the extra slot to launch its fifth daily Heathrow service, making Cathay the largest Asian airline at Heathrow ranked on seats, and 11th largest at the airport overall. Since late 2005 Cathay Pacific has operated more frequencies and capacity into London Heathrow airport than regional peer Singapore Airlines, making Cathay the largest Asian carrier at arguably the world's most important airport for business traffic. Cathay and SIA were typically in the ranking of top 15 carriers at the airport based on capacity – a stunning development and testament to Asia's growth, considering Cathay only commenced services to Heathrow in 1991 (it started Gatwick services in 1980). SIA (or as it was known then, Malaysia-Singapore Airlines) commenced London services in 1971 – nearly a full decade before Cathay. Although the two at times dovetailed on capacity, Cathay lost its edge at Heathrow to SIA in mid-2012, a result of three factors: first, Cathay accelerated replacement of 747-400s with less dense 777-300ERs, leading to reduced seat counts (but, critically, overall better profitability). Second, SIA had been replacing 747-400s with higher-capacity A380s, and third, SIA from Sep-2012 introduced a fourth daily Singapore-London service after reaching a commercial agreement with South African Airways for a forthcoming empty slot. SAA was ending its Cape Town-London Heathrow service, a result of increased competition, higher costs and status as an end-of-the-line operator. The SAA decision received fierce negative local sentiments, not unlike when Qantas has pulled down its loss-making international network. In these instances carriers have previously supported the loss-making routes but eventually determined doing so no longer carried enough strategic benefit and that subsidising them was too onerous. Cathay, from 27-Jun-2013 until the end of the summer scheduling period, will add a fifth daily seasonal Hong Kong-London service, giving it the frequency advantage it lost in late 2012 when SIA commenced its fourth daily London service. Cathay will have a capacity advantage, but barely: over northern summer when its fifth daily service operates, its five (mainly 777-300ER) services will have 178 more seats a week than SIA's four (mainly A380) services. It would not take much to shift peak capacity into SIA's favour once again. Only one of SIA's three A380 services uses the more dense configuration of a mixed business/economy upper deck. Converting one of the other two frequencies to that configuration, or replacing the 777-300ER service with an A380, would give SIA the edge over Cathay. Meanwhile if Cathay replaced the three-class 777-300ER or 747-400 with a four-class 777-300ER (likely as 747 retirement is being accelerated), the capacity would be less than at SIA. Cathay confirmed to CAPA it is using the slot from Air New Zealand's Hong Kong-London service, which the NZ carrier is relinquishing from Mar-2013. At the same time as Air NZ announced its exit from Hong Kong-London, the carrier concluded a partnership deal with Cathay covering reciprocal codeshares on the Hong Kong-Auckland route they both operate, as well as interlines beyond Hong Kong to points in India and China (regulatory approval for third country codeshares into China are difficult to secure). The partnership was notable as the two are in different alliances (ANZ in Star, Cathay in oneworld) and Cathay is fiercely independent, favouring few partnerships. Air NZ had previously operated its London service via Singapore, but could not secure suitable connections with fellow Star member SIA; then briefly operated to Shanghai before closing the deal with Cathay. Cathay was undoubtedly glad to see one less competitor on the Hong Kong-London sector following Qantas' Mar-2012 withdrawal. Air NZ at the time tried to distance the Cathay partnership from its pulling off the Hong Kong-London route even though the two went hand-in-hand. Cathay is now trying to distance the slot acquisition from its earlier partnership with Air NZ. Cathay confirmed to CAPA it will use Air NZ's Heathrow slot for the fifth daily service, but said: "The timing of this and the strategic agreement with Air NZ is coincidental. The two are unrelated." Air NZ's decision to withdraw from Hong Kong-London concludes a year-long review to stem long-haul losses and focus more strongly on serving the Pacific Rim. It launched Hong Kong-London services in 2006 with a daily offering before consistently reducing the operation to five weekly flights in Sep-2009, with occasional increases over peak periods. Auckland-Hong Kong-London complemented Auckland-Los Angeles-London. ANZ CEO Rob Fyfe told CAPA in Oct-2011 that Hong Kong-London only under-performed Los Angeles-London at certain times of the year; it was not consistently doing worse. But Air NZ has since determined – undoubtedly with the influence of the Cathay deal – to pull off Hong Kong-London. Air NZ deputy CEO Norm Thompson told Aviation Week that Hong Kong-London had a 10% higher operating cost due to factors including Hong Kong landing fees and Russia overflight charges. Additionally, Los Angeles-London attained a higher yield, partially due to ANZ deploying 777-300ERs with more premium products rather than its older 777-200ERs (although these are due for retrofit later this decade). The -300ER for example includes the SkyCouch in economy, which adds little cost but offers large yield upticks. Air NZ was also restricted in the number of passengers it could carry between Hong Kong and London. Cathay's increase will see it become the 11th largest carrier at Heathrow ranked on seat capacity, but overall given British Airways' high exposure at Heathrow, Cathay and SIA will each account for only about 1% of northern summer capacity at Heathrow. Cathay and SIA have seen some competitive relief as end-of-line carriers address their loss-making European services. In addition to Air NZ's Mar-2013 withdrawal from Hong Kong-London with five weekly 777-200 flights, Qantas in Mar-2012 pulled off its daily 747-400 Hong Kong-London service (as well as Bangkok-London). In Mar-2013 Qantas will shift its Australia-London flights from a stopover in Singapore to Dubai as part of its historic Sep-2012 partnership with Emirates. SIA will also experience relief, when Qantas accelerates the withdrawal of Singapore-Frankfurt services from 15-Apr-2013. The competition Cathay and SIA saw from these services varied. 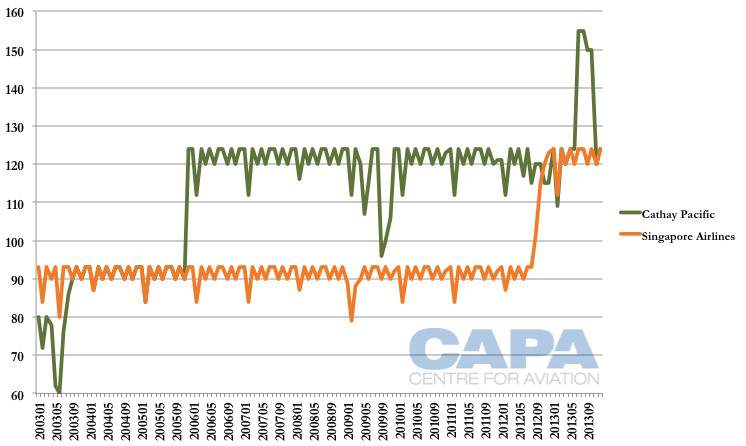 About 85% of seats on Qantas' European services were filled with passengers originating in Australia, leaving Qantas with about 15% local point of sale (although some passengers connected to other carriers in Singapore, notably Jet Airways to India). This dispels notions propagated by excitable press outlets that the withdrawal of Air NZ and Qantas is enabling other carriers to replace their services exactly. These approximately 15% of seats had direct competition with Cathay and SIA, although in theory the entire Qantas network was in competition with Cathay and SIA, as both Asian carriers aggressively target sixth-freedom Australia-Europe passengers. Qantas' shift from Singapore to Dubai will eliminate local point of sales for European services for SIA, but the entire journey will still be competitive – in fact, it could be even more competitive. Air New Zealand was meanwhile restricted to selling no more than 50% of Hong Kong-London seats to passengers not originating or destined for Auckland, where the flight originates. 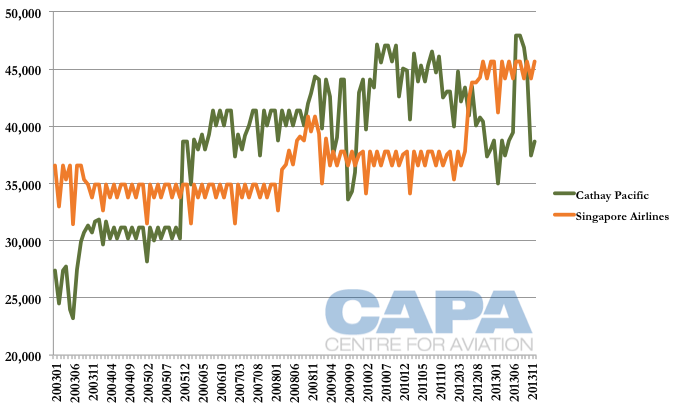 The reduction of capacity from Air NZ and Qantas does leave some slack for Cathay and SIA to pick up, but not a tremendous amount. The additional flights are well supported by the carriers' hub networks. There is also opportunity for Cathay and SIA to try to gain some traffic from their respective hubs to London that currently diverts through another city. There is significant diversion of traffic between Hong Kong and London via hubs elsewhere in Asia, the Middle East and Europe. 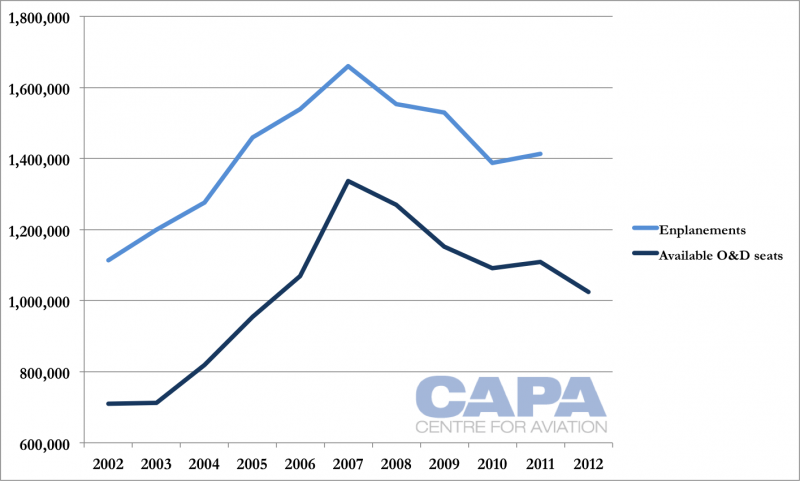 In 2011 the UK CAA reported there were 1.4 million passengers travelling between London and Hong Kong, but in that year there were only 1.1 million available O&D seats in the market. Assuming a load factor of 85% of available O&D seats, one-third of the total Hong Kong-London market makes a connection en route. This is a significant pool to take from considering there are upwards of eight daily widebody flights (four on Cathay Pacific, two on British Airways and one each from Air New Zealand and Virgin Atlantic). Additionally, British Airways has spoken of Hong Kong being one of its first A380 markets while Virgin Atlantic would consider a double daily service if slots permitted. Singapore-UK sees a significantly lower level of diversion. While the service increase comes as direct competition (ANZ and Qantas) reduces, Europe is seen as being in the economy doldrums. But for Cathay, London is an exception, with GM revenue management James Tong predicting in Jan-2013 that "long-haul routes such as North America and London should continue perform to well" – this in contrast to Cathay's other long-haul routes, mainly around continental Europe. The scarcity of London Heathrow slots coming onto the market means there is limited leeway for optimal timing of services, further complicated if the other port of a service also faces a tight slot environment, as Hong Kong and Singapore do. Air NZ's Hong Kong-London slot consists of a 14:45 arrival and 21:05 departure. Cathay's new service, CX239/CX238 arrives in Hong Kong at 16:15 and departs at 22:35. The new fifth daily flight will overlap with an existing service that arrives within 15 minutes on both sectors. Singapore Airlines was in a similar position when it acquired South African Airways' slot used for Cape Town-London that arrived in London at 06:20 and departed at 21:00. SIA initially operated with a 06:20 London arrival and 20:00 London departure (there was also an 18:30 and 22:05 departure) but later changed the departure to 15:15, allowing for a more spaced scheduled as there is at least three hours before the next service. The additional service will give Cathay two morning flights compared to SIA's single morning flight. Both of Cathay's morning flights will typically be operated by 777-300ERs in Cathay's three-class configuration of business, premium economy and economy (no first class). Meanwhile SIA's morning flight is typically on A380 with all-business class seats on the upper deck, giving Cathay an extra 1,832 weekly seats in the morning hours. Cathay will likely more heavily target the local Hong Kong market as well as connections from Australia. Flights from Brisbane, Melbourne, Perth and Sydney all arrive in Hong Kong in the early morning. Morning arrivals from Hong Kong predominantly include long-haul flights, whose passengers would not connect onwards to London; Indian flights, whose passengers are also unlikely to connect to west-bound destinations given the circuitry; and limited regional flights, including Jakarta, Kuala Lumpur, Singapore and Taipei, which would have varying but overall low interest in connecting to London. Cathay and wholly-owned subsidiary Dragonair's single largest market is China, and flights from there to Hong Kong typically arrive late morning at the earliest, limiting connection opportunities. While much is correctly said of the growing ambitions of mainland Chinese carriers – and notably China Southern – to be powerful sixth-freedom operators, London is a lighter market for them: China Southern only began serving Heathrow in 2012 and in northern summer 2013 will have only five weekly services, and even then only on its relatively small A330-200. London is extremely competitive and generally low-yielding for sixth-freedom traffic compared to other European points, so while Chinese carriers may ultimately have their sights set on London, it will be a gradual expansion for them. The lack of keen interest is also a result of visa restrictions: Chinese nationals who receive a UK visa (and this is not a given – the UK government has been criticised for its lengthy visa application system) can only visit the UK, whereas a Schengen visa allows travel to Schengen countries, allowing for a wider trip. With Chinese carriers still improving international marketing, they are heavily reliant on the outbound-Chinese market, which has a leisure focus to it, further reducing immediate interest in the UK (Chinese carriers need staple O&D traffic before targeting sixth-freedom opportunities). Nonetheless, Cathay's additional London service could be something of a pre-emptive move. Elsewhere during the day Cathay and SIA approximately match each other in terms of scheduling. Cathay differs in product in two ways: its morning services typically will not have first class whereas SIA's A380 and 777-300ER services all do. Cathay also offers premium economy, which SIA does not. Although slow to adopt it, Cathay expects considerable revenue growth from this class. Cathay's three-class 777-300ER has 32 premium economy seats (9% of total) while the four-class 777-300ER has 34 seats (12%) and the 747-400 26 seats (7%). The fifth daily London service's timing is within 15 minutes of an existing service, exemplifying the debate Cathay will have as it considers a future of growing through aircraft size (such as ordering A380s or passenger 747-8s), or frequency, its longstanding preference. There is room in Cathay's London timetable for services at other times, but the lack of slots – Cathay says it has been wanting to increase London "for some time" – hinders the ability to realise a smooth distribution of services. Effectively combining two flights within 15 minutes of each other by replacing them with a larger-gauge aircraft is directly more economical – but the equation becomes muddied as soon as other factors get taken into consideration, including freight, if frequency can be adequately grown at other airports, the cost of adding a new aircraft type and, of course, the cost of whatever aircraft is bought. A decision to purchase very-large aircraft (VLA) like the A380s or 747-8Is, which Cathay is once again evaluating with a decision expected in 2013, would contain complex ingredients – possibly more so than for any other airline. 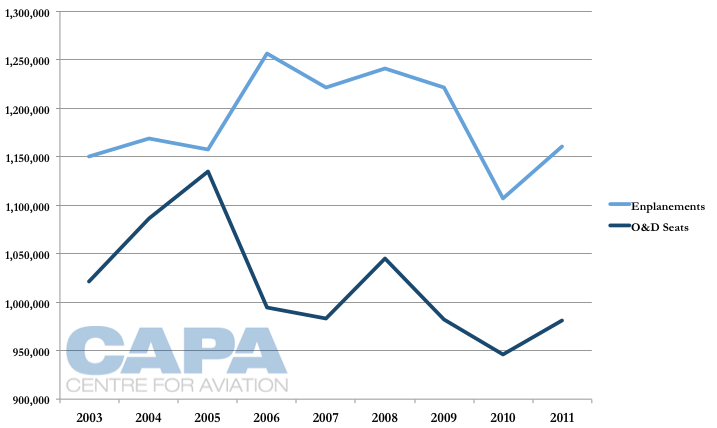 The central question is if Cathay will grow in frequency or size. Frequency has been the preference, but a handful of long-haul destinations see three or four daily services. That allows Cathay to hit all of its scheduling banks. An additional frequency could bring limited strategic and scheduling benefits whereas up-gauging services to a VLA could be more economical than adding a frequency. All of this is a moving target in the context of price. The slightest additional discount could change the calculation. Airbus for years has wanted to sign Cathay up for the A380, and Boeing no doubt would be willing to offer discounts on its 747-8I as Cathay’s order could boost the aircraft’s reputation, which has few airline customers (although as Boeing argues, it was always going to be more popular as a freighter). The cost equation is helped by Cathay having the freighter variant of the 747-8, and there could be further synergies for Cathay by pooling its potential fleet with Air China, which has ordered five 747-8Is. A VLA fleet would likely be niche – and not number the 50 777-300ERs Cathay plans to have. Further details in any decision would have to include the impact of structural shifts affecting Cathay. The A380’s strength is in carrying passengers, not freight. If a dedicated freighter fleet loses its attraction, Cathay may find aircraft like the 777-300ER and A350-1000 better balances between freight and passenger demand. Keeping a sizeable freighter fleet would likely warm up the equation for VLAs as the VLAs (strong with passenger load, weak on cargo) could be complemented by dedicated freighter aircraft. Cathay will need to decide how actively it can participate in sixth freedom markets. With increasing Chinese competition, Cathay will need to look at growing revenue without large capacity increases, in which case VLAs could be inappropriate. In the end, many expect Cathay to continue its conservative strategy rather than have the large ups and downs in profitability VLAs could bring. As for future growth, Cathay is due to take delivery of 13 777-300ERs from 2014 to 2017, after which the carrier will have only A350 XWBs on order. For both Cathay and (mainline) SIA, profitability has become a much more compelling priority in the past couple of years; getting the mix of capacity, frequency and product right is a moving target. London Heathrow remains a favoured airport and, as such is an interesting indicator of how each airline is addressing this combination of factors. Part Two of this report, to be published later this week, will examine other greater Asia changes at Heathrow: Emirates expands virtually with its Qantas partnership; Air China and Korean Air complement Heathrow services with Gatwick; Garuda to launch services to Gatwick; MAS goes double A380 daily to Heathrow; Thai Airways intends to keep its A380s out of Heathrow; and Philippine Airlines weighs London service if the Philippines is removed from the EU blacklist.